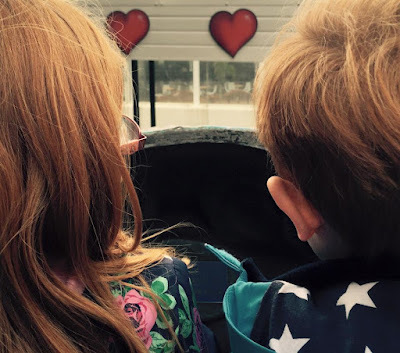 We visited Blackpool Pleasure Beach last month as a family of 2 adults and 3 children aged 4,6 and 8. 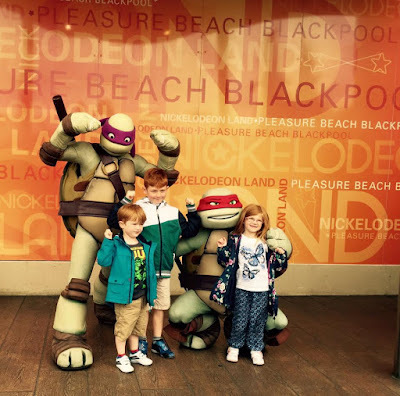 Whilst there is a lot for children to enjoy in the main Blackpool Pleasure Beach, as huge Nickelodeon fans, Nickelodeon land is where we spent most of our time. Entry to the whole of Blackpool Pleasure Beach and Nickelodeon Land was included in our Blackpool Resort Pass (£55 for entry to 6 fun-filled Blackpool attractions) however you can also purchase tickets 'on the door' or pre-book online from only £16 for juniors and £18 for adults (off peak prices, booked online 10 days in advance) which is AMAZING value considering one of our local theme parks charges more than double this. Nickelodeon land is part of the Pleasure Beach and you don't need an extra ticket to enter. Everyone is given a wristband that is scanned as you enter each ride. 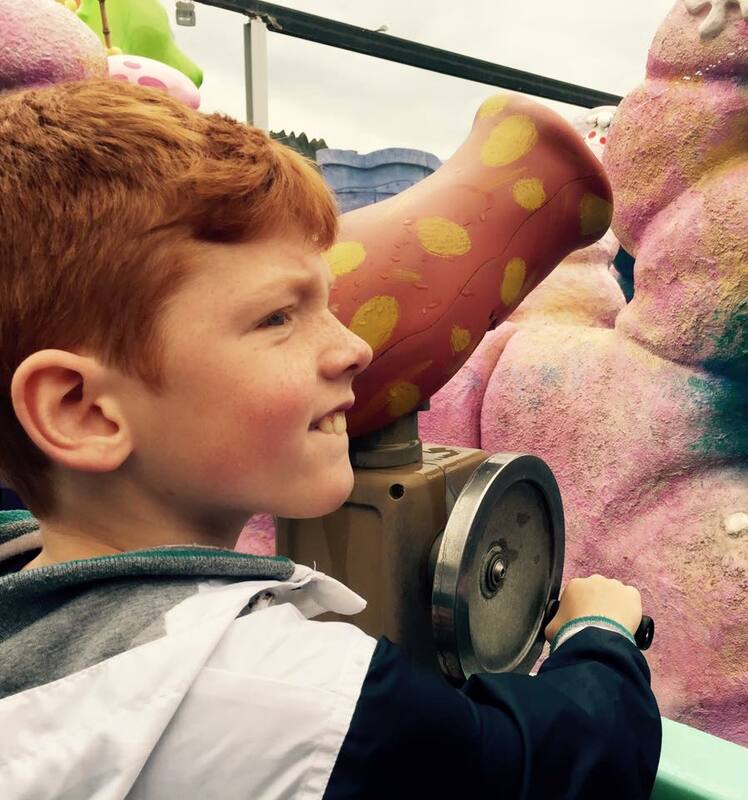 There are 19 rides throughout the park that have no height restrictions and more that you can ride with an adult. SpongeBob's Splash Bash was easily our favourite ride. There are height restrictions (main one being if you measure 95cm-120cm you must be accompanied by an adult). The five of us all fit inside our own Jellyfish and took a seat behind our own water canons. When the ride started we had so much fun shooting the other jellyfish and guests with water as the ride spun us around. Lots of fun but you may get a little wet! 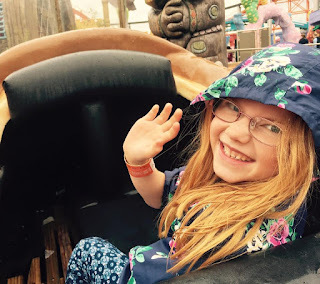 The Rugrats Lost River was our second favourite ride and was the first time any of our children have been on a water flume. It was fairly tame but it was lots of fun - I love hearing Heidi giggle in the video above as the boys chute down! Children under 117cm must be accompanied by an adult. As huge Dora fans this ride was like jumping inside our favourite tv show as we floated around France, Russia, Tanzania and China, learning how to say 'hello' in each language along the way. Who says theme parks can't be educational? Children under 120cm must be accompanied by an adult. This ride certainly did get us in a spin. You can let your children control when you go up and down which can lead to a rather bumpy ride! Children under 120cm must be accompanied by an adult. Again, children under 120cm must be accompanied by a grown up. This ride is lots of fun as you rise in the air like a hot air balloon giving you fabulous views around the park and beyond. We could easily spend a whole day and more at Nickelodeon land and Blackpool Pleasure Beach. We were there in the school holidays and we rarely had to queue longer than 5 minutes and stepped onto a lot of rides straight away. The longest we had to queue was about 15 minutes for Wallace & Gromit's Thrill-O-Matic but I have to say if you a fan, it is really worth it as it was lots of fun. The park is open from 10am-8pm in the school holidays which again is fantastic value for money when compared with many traditional theme parks who close at 5/6pm. There were photo opportunities throughout the day in both the main park and Nickelodeon land and we enjoyed meeting Dora and Boots, Shaun the Sheep and our favourite Ninja Turtles throughout the day. You are spoilt for choice when it comes to choosing somewhere to eat. There is a dedicated picnic area just outside of the park (lockers available) or lots of restaurants and cafes to choose from with something for all tastes from champagne and oysters to all you can eat buffets. We were dining from an All You Can Eat Meal Deal which costs from £15 (if pre-booked online) and includes as much as you can eat and drink from 7 outlets throughout the day, If you are planning a whole day at Blackpool Pleasure Beach I would highly recommend this option - being able to enjoy brunch, lunch and dinner plus snacks and drinks throughout the day for this price is definitely good value. Our trip to Blackpool Pleasure Beach was a lot of fun for everyone and definitely good value. Reading/watching all about Blackpool is making me want to go back so bad! I need to twist's R's arm! !